Thanks for checking in Judi, glad you're okay.! Looks like you've got quite a mess there. Any news of Walter????? Did he drown??? Does he need mouth to, ah, um.......nevermind. Whoa! Please tell me you conquered that debris with power tools, not manual. Land looks reasonably dry; hope all is well with you and yours. ¹sadly, MY chainsaw runs on electricity so i didn't get to use it. judi's computer must run on kerosene. I did some tree trimming here (D/FW), manual polesaw, loppers, and bowsaw. But it was to get branches off the roof, raise the canopy - not for disaster recovery. Consider yourself hugged from someone else with sore arms and have some virtual chocolate on me. What a mess. Glad you're okay. This, for obvious reasons, made me think of you. ick. glad your roof appears intact. what of walter??? Might I suggest the blog, bloggerette, and various family members move someplace a little safer, like a heavily guarded underground concrete bunker in the middle of nowhere? With internet access and plenty of beer, of course. 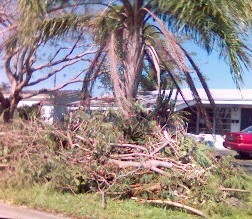 You know with the amount of hurricanes lately, how is it ya'll still have trees to blow over? I am surprised that Florida hasn't been broken off and blown to Europe. Bryce, that's a little creepy. It was just once. And Dave was mostly clothed. Brainy!! Thanks for the tackle yesterday! Cool sign! Do you know where that place is?? I may have to move there! Bryce, I actually got some books autographed by Dave when he came to town 4 or 5 years ago. I don't believe he was 'into' blue shirts then, but yes, he was clothed. Mostly. To review: Dead cats--not funny (mostly). Hurricanes hitting funny people--not funny. Hurricanes hitting funny walrus parts--funny. p.s. that's my son's crapcam :) why does it take better pictures than dave's? So glad to hear you're all right. Without you, the world would be a less funny place, and that we don't need. I mean, who would pose with Walter if you weren't around? Punkin - I regret that I have no idea where that building is. Here is where I found it. If nothing else, there are some good laughs. We're all thinking of you Judi--in our heated, electrically-unchallanged homes. Glad to know no one was hurt. I'm glad you're OK judi, thanks for letting us know! Glad all is (comparatively) well in your neighborhood. Glad to hear you're doing OK, Judi - I wish you a handsome, avialable young man to massage those sore muscles! Has anyone heard from DJTony? Yeesh, hope that didn't hit your roof or car. Or person! "I hope the roof doesn't blow off! Did I update the blog?" Glad you're okay, judi. I hope the hurricanes are over for the year--if not forever. Florida and the Gulf Coast have hurt enough. Glad all is right with you (not counting your back and arm). Hope you can get a generator soon. Can't imagine living weeks without electricity! doesn't matter if i have a generator. it's impossible to get gas. passed a line of a mile and a half, today. I passed a kidney stone once, but it sure wasn't a mile and a half. Still made me sore, though. Glad you and yours are okay. You (and His Daveness) crack me so consistently up. judi, I'm flying into Orlando next week. Shall I fill my luggage with gasoline for you?